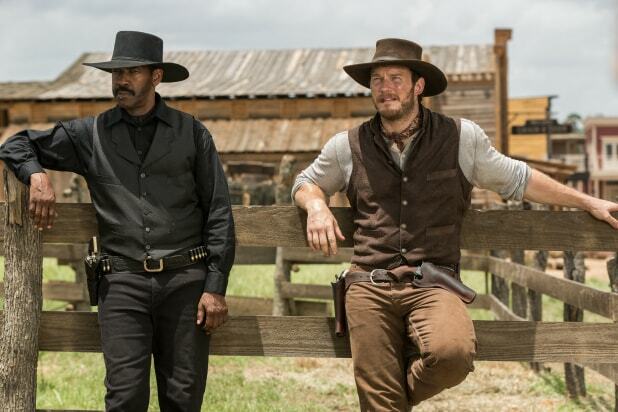 A 1960 American western indebted to a 1954 Japanese samurai epic is now another example of flashy 21st century Hollywood property-management with director Antoine Fuqua‘s “The Magnificent Seven” remake, starring Denzel Washington and Chris Pratt. A handsomely made if lackluster riff on John Sturges’ epic about desperados hired to save threatened villagers, it won’t challenge the original’s supremacy as a big-cast entertainment with a wry, redemptive sense of humor. But it can certainly lay claim to the same problem as that previous version: What shallow fun there is doesn’t survive the final shootout; in this instance, it’s just one more death knell for the crisply made action sequence. This movie’s community of fear is no longer a bandit-plagued Mexican village but an American mining town under the thumb of land-grabbing, violent industrialist Bartholomew Bogue (Peter Sarsgaard). Watching Bogue disrupt a Sunday service to expound upon power and stealing land for cheap, before he murders a concerned citizen in cold blood and lets goons burn the church to the ground, it’s tempting to call this villain intro overkill, but Sarsgaard’s oily awfulness has a nice mood-setting sting to it. Then one sees the heaving cleavage of freshly made widow Emma Cullen (an otherwise steely Haley Bennett), and it’s like being slapped back into the reality of holding on to male moviegoers’ attention. Committed to taking matters into her own hands, Emma leaves Rose Creek to hire armed protectors. Her first ask is to brooding, black-clad Sam Chisolm (Washington) just after he’s endured a tense barroom face-off trying to bring a fugitive to justice. Arguably the movie’s most iconically enjoyable scene — thanks to Mauro Fiore’s sweat-and-shadows cinematography, John Refoua’s editing and some choice slices of showdown dialogue from screenwriters Nic Pizzolatto (“True Detective”) and Richard Wenk (“The Equalizer”) — the saloon confrontation also introduces the second of the seven: Pratt’s hard-drinking, wisecracking gambler Faraday, who likes to play card tricks during sticky situations. Though the characters are ostensibly different, the gunslinger-to-gunslinger banter between Washington and Pratt is intended to be this movie’s version of the Yul Brynner/Steve McQueen dynamic. It does its job early on, even if McQueen’s mix of youth and gravitas at the age of 30 is far and away more interesting than Pratt’s stunted-adolescent vibe in his mid-30s. The performances are dedicated, but the camaraderie feels perfunctory, outside of a few ruminative exchanges between Hawke and Washington, whose characters were on opposite sides of the war. More startling is how holstered Washington feels throughout, even though his elite status playing avengers means he was destined to rock a gun belt and a Stetson at some point. An actor whose signature blend of intensity, charisma and chops make him arguably our foremost cinematic leading man in the classical sense — one can’t imagine his previous movies with Fuqua (“Training Day,” “The Equalizer”) working as well without him — he’s never allowed to brand his screen time in any meaningful way while having to share hero duties. Though he gets his private showdown at the end, juiced with a backstory revelation, it feels too-little-too-late. There’s certainly no “too little” applied to Fuqua’s handling of the climactic siege on Rose Creek, and the gang’s spirited defense of it. But while the image is of a long, long line of Bogue’s men riding toward their third-act destiny is a sweeping one, it’s also a body count in waiting, cluing moviegoers in to just how stretched-out the impending mayhem is going to be. Where shootouts used to be tight, sweaty-palm affairs marked by staredown foreplay and quick draw action, in this “Seven” that’s the delayed dessert once the dust clears from a time-consuming run-and-gun war between an army and a platoon. If remaking westerns is what it takes to get westerns made, then this “The Magnificent Seven” — which thankfully doesn’t forget to tip its 10-gallon to Elmer Bernstein’s famous score — will do for now until somebody else gets in the saddle. There’s certainly enough verve, and love for the genre, to help one get past its trouble spots, but you can’t help feeling the mercenary thinking behind rehashing this mercenary yarn. Are you ready for a remake of a remake? 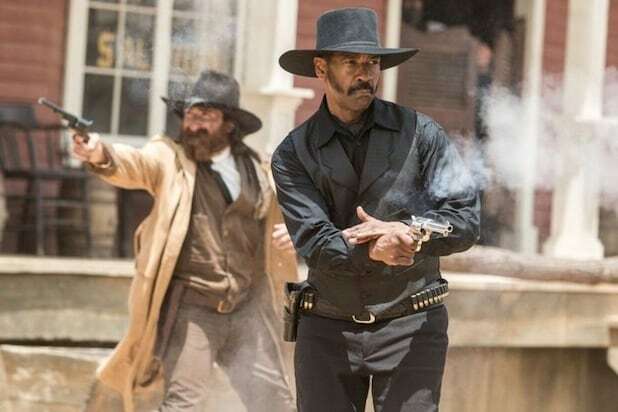 USA Today has released the first pictures from Antoine Fuqua's remake of "The Magnificent Seven," which itself was a Western remake of Akira Kurosawa's "Seven Samurai." Both movies are classics, and the usual question of "why do we need this?" that accompanies any remake will assuredly plague this most recent one, even though Kurosawa's story has inspired numerous other films, like "A Bug's Life." Fuqua's film answers this question with an impressive cast led by Denzel Washington and Chris Pratt. Also included in the Seven are Ethan Hawke, Byung-hun Lee, Manuel Garcia Rulfo, Martin Sensmeier, and Vincent D'Onofrio sporting a glorious old-man beard. What's more, this cast will not reprise the roles played by Yul Brynner, Steve McQueen and the rest of the 1960 cast. Sensmeier, for example, will be playing a Comanche warrior named Red Harvest; and Pratt, playing to type, will be a dynamite-loving gambler. The villain is not a bandit, but a greedy industrialist played by Peter Sarsgaard. "The Magnificent Seven" hits theaters on Sept. 23.